Developer James Vaughan insists his game stands on its own, and hopes to coexist with Dark Realm Studios. Last month, IGN writer Justin Davis published an article titled, "How Copycats Built the Video Game Industry", a piece that explored the topic of clones while reminding his audience that everything is a remix. 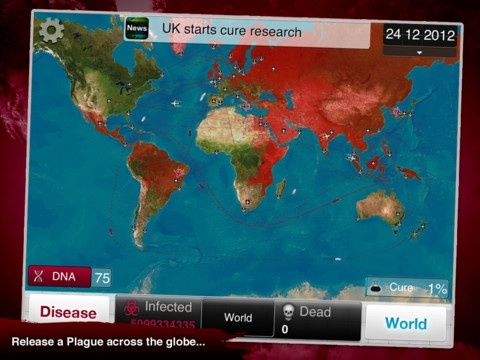 Especially interesting was a quote from Dark Realm Studios, where the mobile developer specifically identified Ndemic Creations' popular iPhone and iPad title, Plague Inc., as a clone of its equally successful Pandemic 2.5. Hey Justin, thought you'd like to know that Plague Inc is simply an attempt to cash in on Pandemic 2.5. At first glance, it appeared that Dark Realm Studios had a point, since Plague Inc. and Pandemic 2.5 involve spreading disease. At the same time, both these games appeared on the App Store in May 2012, leaving us to wonder if they were created by two different developers completely unaware of what the other was doing. On that note, we contacted Plague Inc. creator James Vaughan to find out what he thinks of Dark Realm's accusation. Dark Realm Studios called you out to IGN, saying "Plague Inc. is simply an attempt to cash in on Pandemic 2.5." What's your reaction to that? Is this simply the nature of the App Store, or the story of two games being developed at the same random time? Remember, development of Plague Inc. began over a year ago, long before Pandemic 2.5 was even announced. There was absolutely no attempt to cash in on the release of Pandemic 2.5 or any other game. I was just working to produce a fantastic game as fast as I could. Plague Inc. is a unique game that significantly evolves the genre. I wasn't worried when I heard about Pandemic 2.5 because I knew that Plague Inc. was going to be a very different game. We are not playing a zero sum game. Both of us can do well, and have done so. The false accusation from Dark Realm Studios was disappointing, and I would have preferred that they replied to my contact attempts before lashing out in public. Happily though, things have calmed down since then. I believe that Dark Realm Studios actually got back to IGN and said that they have "decided to compete via improvements and new games." This is fantastic news, as it will result in even better strategy games for players all over the world. Plague Inc. is just the beginning. Is this simply a coincidence? James has a point, but let us know what you think in the comments section.